They say love can happen anywhere. Sometimes, out of thin air. And sometimes, even in the air. 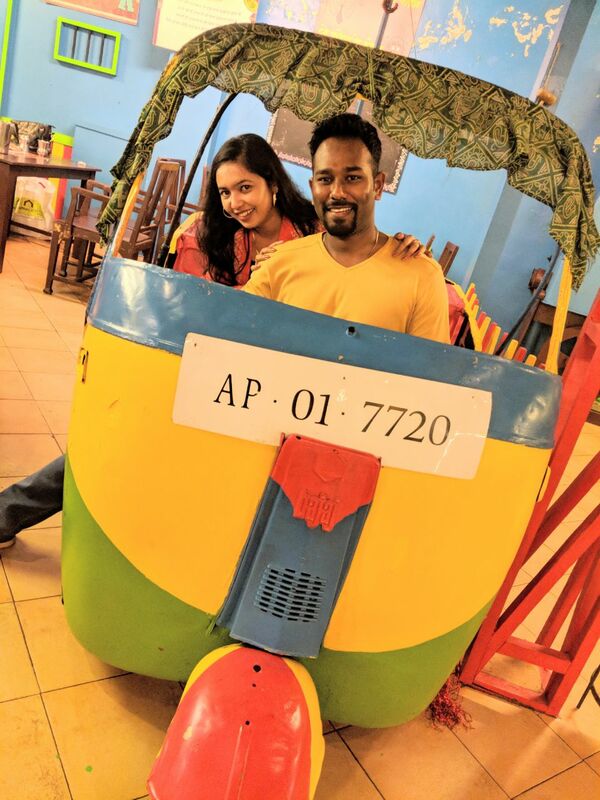 Karthik is a Pilot, and Anamika is a Cabin Crew, they work for the same airline’s company. Read on to find out the story of—their airborne love, marriage and of course, their perfect wedding rings…which AuGrav had the privilege of creating. First of all, Karthik, can you tell us a bit about your love story? How did it all happen? Well, we both work for the same company. We joined the airlines around the same time. Our first meeting was in our staff canteen somewhere in September 2015. We stayed in the same company guest house for 6 months, and that’s how we got to know one another. We became good friends at work, off work. It was very simple, no romantic gestures, no proposal. Just two friends who decided to take our friendship to the next level. Wow! So, what happened after that? On the family front? I’m from Chennai and she is from Guwahati. When I told my parents, Anamika is from Guwahati, they said—okay, first we should check the map to see where it is. Haha…I’m just kidding. Of course there was this cultural difference between our families. However, things got smoothed out with time and eventually everything fell into place on both sides, and here we are! How did you plan the wedding celebrations? We had a wedding and a reception in Chennai, and another reception in Guwahati. The preparations started around 7 months prior to the even, that’s around July-August 2017. And we got married on 19th January 2018. When did you exchange the rings, was there an engagement ceremony too? We exchanged the rings on our wedding day. No, there was no engagement ceremony, as such. How did you come up with the idea of the ring? Was it your idea or your wife’s? Tell us about it. So, Anamika was browsing for rings online and a pair of couple ring caught her attention. 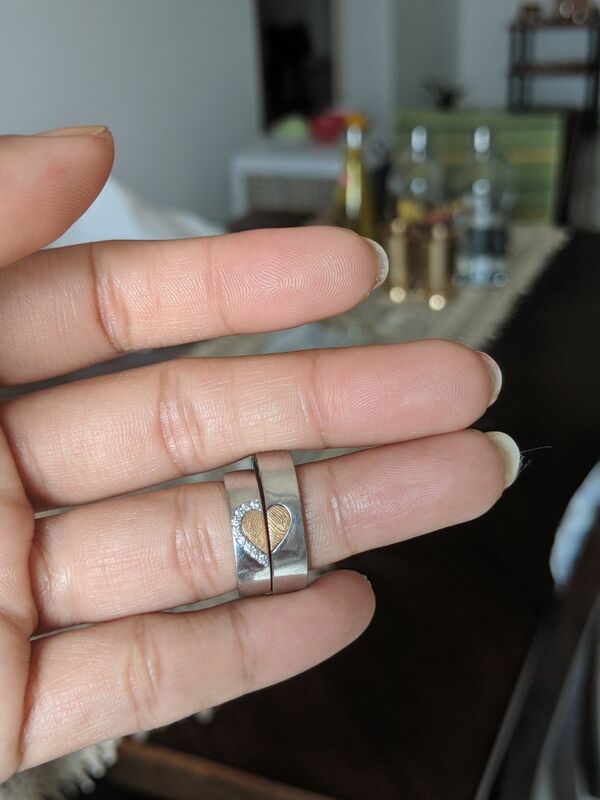 Each ring had fingerprint impressions of the other partner, in the shape of a half-heart, and when two rings were placed one on top of the other, it would become a complete heart. The rings had two metals, gold and platinum, and also diamonds. She found the design in a blog online and we both loved it! But, our challenge was to find someone who would design it for us. I took up the job. In short, it was my wife who found the design and I found the place where we could get it made. First, we took the design to all the major jewellery shops in Hyderabad. Most of the jewelers said, it couldn’t be done.Some said, the fingerprints could be done, but mostly in a simple band. Some said, they could not combine two metals, in this case, gold and platinum. 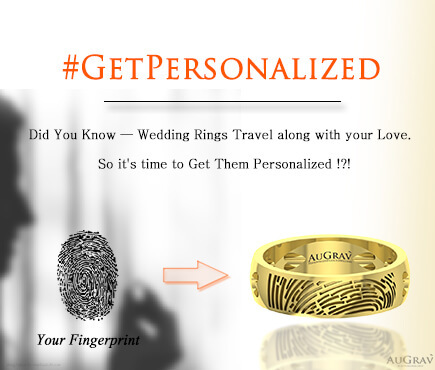 And one day, while looking online for personalized jewellery makers, we found AuGrav. How did it go with AuGrav? I gave them a call and shared the design with them. And they said—it could be done! What about the process that followed after that? 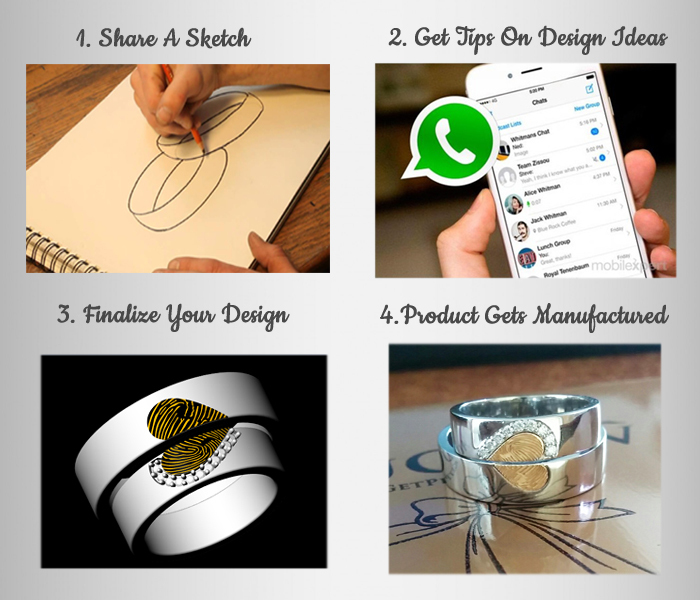 They began the designing of the ring and shared the first 3D sketch with us. In the sketch, we could see the size, shape, design and the thickness of the rings. We gave them a few suggestions, which they worked on and in the third sketch, we got what we wanted. We approved the sketch and they started the manufacturing. My wife was so happy with it that she went around showing to everyone, how our rings would look. After that, it took around 3-4 weeks for the rings to be manufactured. Did you have any doubts about ordering something as important as your wedding rings, online? Yes, my wife was a bit apprehensive about getting the rings made online. We were a bit worried, what if, it didn’t turn out the way we expect. Before placing the order, we checked some reviews for AuGrav on Facebook, and we noticed that all of them had one common point— everyone mentioned that they got what they wanted. And that gave us a huge boost of confidence. How was your personal experience with AuGrav, from start to finish? It was very smooth and easy. Except for the 2-3 phone calls, most of the conversations happened on WhatsApp including the sharing of sketches. And for the delivery, I discovered later that AuGrav was based in Coimbatore, and that’s where my parents lived. So, I asked them to collect the rings once they were ready. That brings me to the next questions, what were the reactions of your family and friends when they saw the rings? My parents, when they went to collect the rings had no idea about the design, metal or anything. So, when my mother saw the rings for the first time, she was totally surprised. She called me up with so many questions—Who selected the design? How did they get your fingerprints on them? Can this be even done? Needless to say, my parents liked the rings and so did my friends and family. Everyone who saw them was pleasantly surprised. The most common reaction that we got was people asking us, where we got the rings made from. If I asked you, what is that one special thing about this whole episode, what would you say? We all buy jewellery from one place or the other, and then that jewellery belongs to us. But, when you have a piece of jewellery custom-made for you, you feel it belongs to you 10 times more. And that’s very special. Beautifully put! Would you recommend AuGrav to your friends and family? If Yes, why? Yes, I would definitely recommend AuGrav to my friends and family. Like I said before, having something designed and customized, for yourself or for people you love, is a great feeling. And at AuGrav, you can get just about anything designed, whether it is from their catalogue or any design of your choice like we did. We got just what we expected and we’re pretty sure you will too! « All You Need To Know About The Stackables! 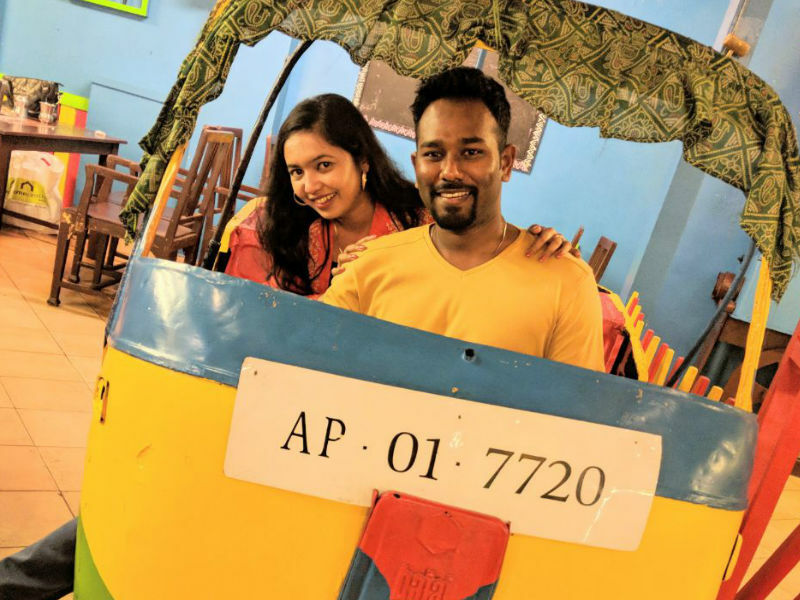 This Pilot Love Story Will Make You Feel Awesome!! Overall rating: 4.7 out of 5 based on 235 reviews.